Every parent is happy to see the growth of his child. They relish the special moments, the time and the bond that they share with their child. When you are a movie star it is not always when you get time off for family and hence every moment is special. 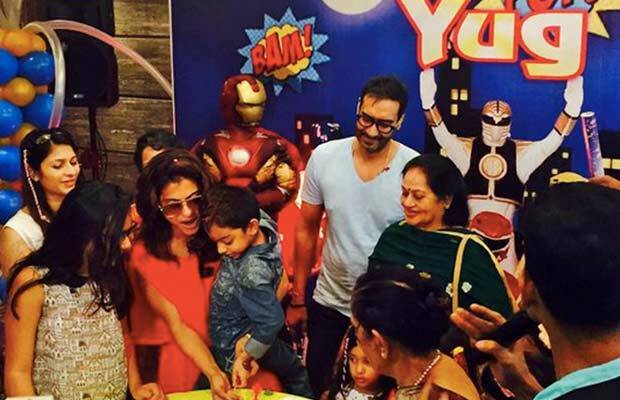 Recently both Kajol and Ajay were together in town on the special occasion of their Son Yug’s fifth birthday. We saw that the stars of our industry were very similar to us when it came to children. Both Kajol and Ajay were seen happy and delighted on this joyful moment. They tied the knot in 1999 and have had two children in the marriage. “Time flies” was what the stars felt while celebrating, they could not believe that their child has become 5 so soon. Also Read: Kajol’s Next Film Will Be Produced By Ajay Devgn! Kajol was all busy with her shootings for Rohit Shetty’s film Dilwale in Bulgaria. Directed by Rohit Shetty, ‘Dilwale’ is much in limelight for its wonderful star cast. Apart from Shah Rukh Khan and Kajol, the movie also features Varun Dhawan and Kriti Sanon in lead roles. ‘Dilwale’ is also in headlines as it will clash with Sanjay Leela Bhansali’s ambitious film ‘Bajirao Mastani’ starring Ranveer Singh, Priyanka Chopra and Deepika Padukone. Both the films ‘Dilwale’ and Bajirao ‘Mastani’ will hit the screens on December 18, 2015. Ajay Devgn on the other hand is riding high with his latest hit ‘Drishyam’. He is quite much in demand as he has proved to be a complete package as he has been successful in doing movies from all genre ranging from comedy to action. Next articleKristen Stewart Admits Breakup With Robert Pattinson Still Hurts!